Last June (2018) something very special happened in the city center of Florence, Italy. A tragic incident - the near-death experience of an 18-year-old boy from Guinee-Conakry – actually led to a treasurable initiative. After a surprising chain of events Favella Painting, The Student Hotel and II Cenacolo: a Florence based social cooperative, joined forces and started a unique project. Together with a group of young enthusiastic and talented newcomers, they created an amazing floor-artwork in the city center of Florence. The creation of Mamadou’s Pool – named after the incident - brought bright new colors to the old renaissance city of Italy and illustrates how art can build bridges between old- and new residents. One day, 18-year-old Mamadou was playing soccer with his friends when the ball was kicked over a fence and landed in a pool of water. Unaware of the depth, Mamadou jumped over the fence to retrieve the ball. But instead of a small puddle of mud, he landed in a deep pool of water. Not being able to swim, this innocent act soon turned into a very dangerous situation. Luckily, one of Mamadou’s friends immediately went to seek help and he was dragged out of the water just in time. The incident took place on the property of Charlie MacGregor - founder of The Student Hotel - who happened to be in the area for the opening of one of his hotels. Charlie went over to see what was going on. Here, he met the team of II Cenacolo: an organization that is working on the social needs of the local community. For the last three years they’ve been providing shelter and activities to the growing group of migrant youngsters in Florence. An important but often under-appreciated task. They are fighting popular thoughts of scared and angry people every single day. Charlie listened to their stories and became very intrigued by their work. Together they thought of possible innovative ways to improve the situation. Charlie had worked together with Favella Painting before, and it didn’t take long for this connection to pop-up. 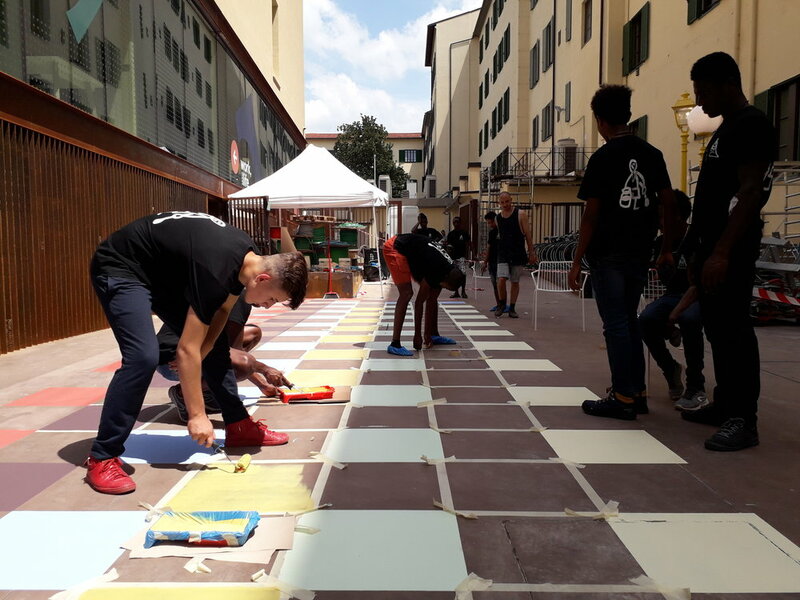 ‘Wouldn’t it be perfect to come up with an artwork for the soon to be opened hotel?’ An idea was born and already six weeks later, they are mixing paint and taping floors in Florence, Italy! Nassira, a cultural mediator at Cenacolo, explains that therefore, in Florence - where art has always played a crucial role - a community art project like this can have huge effects. The creation of Mamadou’s Pool brought color to the city and made it look more beautiful than it already was. As a consequence, the local community saw that these boys can - and are willing to - contribute to society. It strengthened the bonds between the newcomers and the local community and has the potential to change people’s (negative) perceptions. Moreover, the project helped to fight against distress among the youngsters as it distracted them from their current difficult situation. Matteo Bianchi, another social worker, explains they became a tight group and all of them felt proud to be part of it. “They took a lot of photos to share with friends and even encouraged others to do voluntary work, to help the society that you’re in.” The project motivated youngsters to help the society, and by that, making the bonds among each other - as well as to society – stronger. It illustrates how art can function as the social glue of the community. Due to the enthusiasm of the youngsters, the artwork was already finished within a week. And although short in time, its importance was felt everywhere in Florence. Hundreds of people – including the Mayor - joined The Student Hotel opening event. Chiara remembers being a bit worried for that opening night as the boys had to face a situation that they were not used to. “To come to a beautiful hotel, to an event everybody in Florence was talking about and meet all these successful young Italian people.” Fortunately, everything went well and everybody was really happy! Apr 16 How the most crowded road of São Paulo transforms into a city park for all Paulistas.